A key member of the management team at Al Masah Capital Management Limited, Mr. Ghosal has over 17 years of experience in the financial sector. Currently he overlooks the expansion and outreach of Healthcare MENA, making it one of the leading primary healthcare provider in the region. He has much relevant transactional experience in education, retail and financial services. 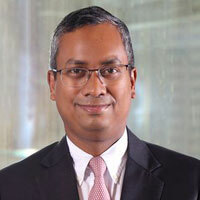 Previously, he has worked with Global Capital Management (Kuwait), ICRA Ltd. (an associate of Moody’s) and Phillips (India) Ltd in corporate finance and credit rating. © 2017 Al Najah All rights reserved worldwide.